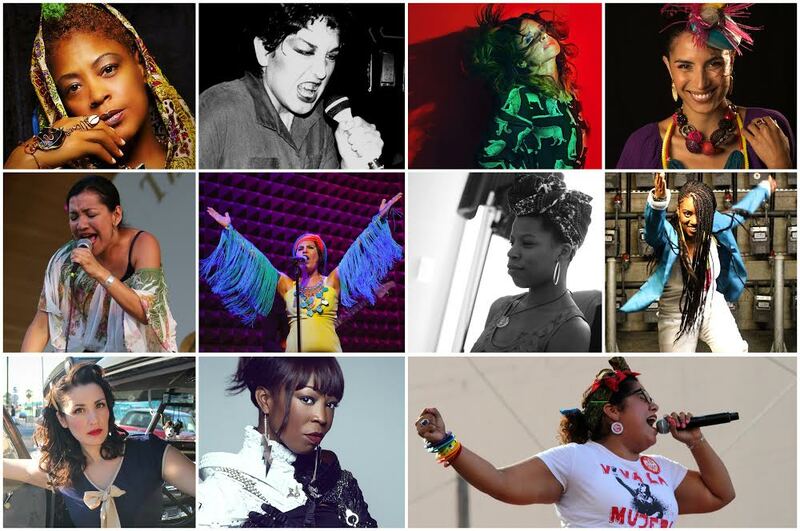 Artivist Entertainment presents an unforgettable evening of music and art by exemplary women artivistas (artist/activists) whose work focuses on stories of resistance, empowerment, equality and social justice that have inspired positive social change in their communities and beyond. The evening's incredible line-up includes iconic punk rocker Alice Bag, GRAMMY® winning Latin alternative singer La Marisoul (of La Santa Cecilia), future-soul godmother Georgia Anne Muldrow, GRAMMY® winning Chicana singer-songwriter Martha Gonzalez (of Quetzal), hip-hop gangsta goddess Medusa, hip-hop artivist Maya Jupiter, alternative hip-hop mic rocker The Oracle Jayne Doe, Tijuana-born ska-punk rocker Ceci Bastida, Dominican Taino singer-folklorist Irka Mateo, indie-soul singer Marisa Ronstadt and world-soul singer/choreographer Kara Mack. The evening features an exciting mix of musical styles including R&B, hip-hop, soul, Latin, punk, alternative rock and world music, by an impressive group of talented musicians mostly from Los Angeles. Artivist Entertainment, an organization created by a group of artists and industry professionals, including Aloe Blacc, brings these important visionaries together because they combine art and activism in a way that builds community while still creating extraordinary music and art. The evening’s set also includes memorable song collaborations never before presented live. An art exhibit curated by the Los Angeles-based non-profit visual arts center Self-Help Graphics features art pieces by women in the community on display together with an installation by the renowned East L.A. master altar builder and educator Ofelia Esparza. She is widely known for her 30 years of Day of the Dead altar installations at Self-Help Graphics. Ofelia’s work has also been exhibited at prominent galleries and museums such as LACMA, The Mexican Fine Art Museum of Chicago and the Centro Cultural de Tijuana Mexico. The exhibit will take place on the Ford Theatres entryway plaza prior to the show. Friday, September 16th, 8:30 p.m. Ticket prices start at $25; Reserved. Artivist Entertainment is a Los Angeles-based organization founded by recording artists and entertainment industry professionals Aloe Blacc, Maya Jupiter, Quetzal Flores, Veronica Gonzalez and Alberto Lopez; dedicated to supporting and creating music and art that inspires positive social change. For more information on Artivist Entertainment, please visit artivistentertainment.com. Parking at The Ford is stacked and costs $5-$10 per vehicle for evening performances. New off- site parking location: a FREE shuttle services the parking structure located at 1710 N. Cherokee Avenue in Hollywood. Parking is $10 for Ford patrons. Shuttle departures begin two hours before show time and reservations are required. Metro riders: a FREE shuttle picks up from the Universal City/Studio City Metro Station (3913 Lankershim Blvd, Studio City 91604). The shuttle, which cycles every 20 minutes, stops in the "kiss and ride" area.